A medieval castle ruin standing proudly on a steep wooded hill- what more dramatic backdrop could there be for keeping exotic animals? 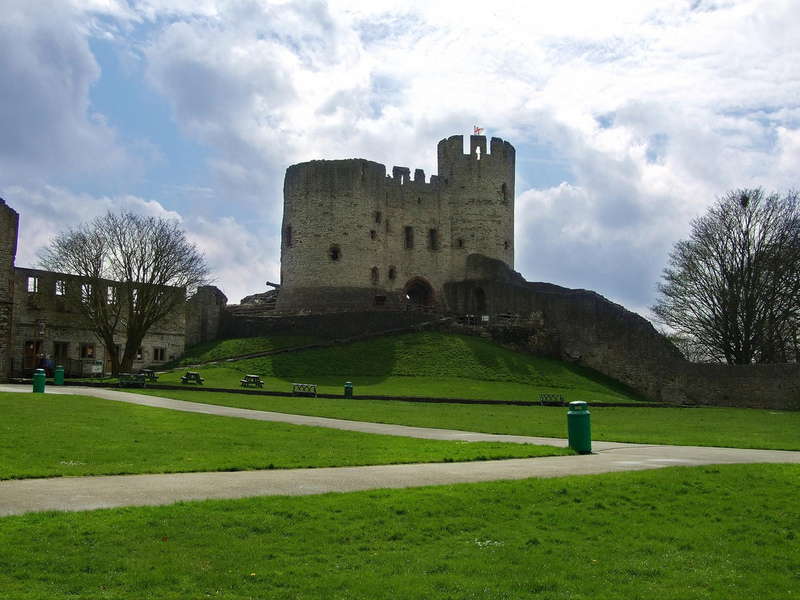 The ingenious concept of converting Dudley Castle’s grounds into zoological gardens came from the owner of the landmark, the third Earl of Dudley, who had a private animal collection during the 1930s. For thousands of years zoos had been associated with royalty and the aristocracy, and were highly fashionable at the time the Earl, William Humble Eric Ward, came up with his unique plan. The Earl’s brainwave turned the historical fortress, owned by the Ward family for generations, into a major tourist attraction as the country’s most modern zoo without bars. “Zoo mania” was catching on all over Britain in the 1930s, but the Earl was convinced that no other zoo in the world could offer a setting to match that of his fourteenth century castle ruin. It was then, as it is now, the focal point and premier landmark of the town of Dudley. In geological terms, Castle Hill was composed of a limestone anticline, thrust up at an early stage in the earth’s history to form an island in the surrounding plain. The castle keep and moat, and the hilly terrain, scarred with ravines and caves, made the seventy acre site unique and visually interesting. The castle provided a natural hub around which the pedestrian routes and main animal enclosures could be planned, and created atmosphere and an unmistakeable reference point for visitors. However, the severe gradients and the presence of huge underground caverns from seventeenth and eighteenth century limestone workings initially presented a formidable challenge to those deciding the zoo’s layout, particularly as there was no map to show where the caverns were positioned. Dudley Council’s Ancient Monument Department appointed an officer to monitor this challenging work, and apparently he was a man of imagination, and gave the architects plenty of latitude in the design of the buildings. He did insist however, that buildings in the vicinity of the castle should be as low and as inconspicuous as possible in character. As the site was very steep, one side was permanently in shadow, and some animals needed to be in the sun, so this was another consideration for the zoo’s layout. Another factor which affected plans was the expense of digging drains through solid rock, so to keep the number of branches to a minimum, buildings were positioned where they could be conveniently connected to the system. To get his zoo built, the Earl worked in partnership with the well-to-do local industrialist family, the Marshes, and Captain Frank Cooper, head of an Oxfordshire Marmalade firm and one of the owners of Oxford Zoo. It was from Oxford Zoo, which was closing, that most of Dudley Zoo’s original animal stock came. Animals were also transported from Hamburg, and from London and Whipsnade zoos. At the time of the zoo’s launch, the directors of Dudley Zoological Society Ltd were Lord Dudley, Sir Herbert Humphries, Captain W F (Frank) Cooper, Mr Walter Marsh and Mr Ernest Marsh (chairman ) The controller and secretary was Mr P. Dudding and the manager was Mr Edwin Wilsdon. The scientific advisor was Dr Hans Honigmann, a Jewish scientist of renown who had fled from Europe to avoid Hitler’s persecution and who went on to perform an excellent job at the zoo during the war years. When selecting the design of the zoo, there had been two main alternatives, the naturalistic method (keeping animals in surroundings imitating their natural haunts) or the modern and more hygienic “theatrical method”, in which the animals were staged in artificial surroundings. The architects chosen to design the zoo were renowned Modernists who called themselves the Tecton Group, taking their name from the Greek word for builder or carpenter. The group was led by Russian born Berthold Lubetkin, who much later in 1982 received the Royal Gold Medal for Architecture. The architectural concerns of the Modernist movement were threefold. Firstly, that architecture should be aware of its social responsibilities, secondly that it should exploit new technologies, and thirdly, that it should move towards the spirit of the age, and so depart from traditional styles. The design for the zoo was structurally daring, making use of a new building material, pre-stressed concrete. As this concrete was reinforced with steel rods inserted under tension, it could be bent into curves and forms impossible to achieve with other materials. Eye-catching curving lines and projecting floors could be constructed for the animal enclosures which did not resemble any previous architectural style in history. Lines were kept simple, and standardised free-curved forms were used in various combinations to give the buildings both uniformity and contrast. Diving ramps extending over pools were created for polar bears and sea-ions. Ramps at various levels were built into the natural wooded hillside of the tigers’ and lions’ pits, and a glass panel was built into the side of the penguin pool to allow visitors to view the birds swimming. The design of all the buildings exploited the advantages of reinforced concrete in overcoming the irregularities of the terrain, and the bear ravine was a prime example of this. Described in the original zoo guide as “perhaps the most impressive feature of the zoo…and probably the largest enclosure of its kind in the world”, it was adapted from a natural ravine and great care was taken to follow its original curves. A large, semi-circular amphitheatre was constructed to give visitors a clear view of the bears, and an existing cavern was adapted to make a cave for the animals to sleep in. The zoo’s restaurant, shaped like the bow of a liner exhibited the nautical imagery of the time, while the design of the circular bird house was purely geometrical. The architects took seriously their social principles and viewed the zoo as a microcosm of society, working out ways to protect the welfare of the animals and meet the needs of the people visiting, including children, who also wanted a clear view of the animals from a safe position. Zoological experts, architects and workmen worked together for two and a half years behind the castle’s stark grey walls, to transform the Earl’s dreams into reality at the cost of around £250,000. Among the companies involved were local metalworkers Hill and Smiths, who continued to construct hay barns for the zoo for many years afterwards. The zoo had been planned to open in June 1937 but the launch was brought forward by several weeks as the country was gripped with holiday fever in celebration of the Coronation of King George VI on May 12. Journalists visiting the zoo just prior to its launch were very impressed. A reporter for the Express and Star wrote: “This will in one respect be the most remarkable zoo in Europe. “I have visited open air zoos in France, Germany, Sweden, Finland, and elsewhere, and never have I seen such arrangements for the comfort of animals”. Shortly after the zoo’s opening, the World’s Fair reported that among the animals found at the zoo were Barbary sheep, cranes, vultures, an eagle, hawks and owls, Bengal tigers, lions, polar bears, llamas, rheas, monkeys, various tropical birds, bison, several types of deer, zebra, sixty reptiles including a viper, tortoises, slow worms and lizards; kangaroos and wallabies, sea lions, beavers, pelicans, brown, black and Himalayan bears, chimpanzees, wolves, foxes and dingoes, and an Arabian camel, as well as Shetland ponies and small tame animals like rabbits and goats in the ‘children’s zoo’ (July 3rd, 1937). Among the tamer animals was Dot, the smallest cart horse in the world, who was only seven hands (28 inches) high. Many of the animals had been chosen because they did not need complicated housing and heating systems, with the exception of the elephants and tropical birds. On completion of the project, Lord Dudley was optimistic that his many acres of zoological gardens would supply the public with an answer to the familiar question: ‘what are we going to do this afternoon?’- and history has proved this to be the case. This is the first section of a 20,000 word history of Dudley’s zoological gardens written by Lyn Alderson. Lyn accepts commissions to write company profiles and histories. Categories: Long form articles | Tags: company histories, company profiles, Earl of Dudley, history of Dudley Zoo, Modernist architecture, Tecton Group, zoo design | Permalink. Writing a memoir: what are the benefits?